America’s goal of expanding alternative energy sources – solar, wind, biofuels, fuel cells and more – ultimately includes an expanding role for electricity. But as the nation strives to reduce its carbon footprint and lessen its dependence on fossil fuels, there arises the need for a workforce capable of bringing about the vision of a renewable future. For three decades and more, the Powering America team has been out front in the energy revolution, long before the word “green” became fashionable. Powering America has been instrumental in developing the “Smart Grid” – making the use of new and alternative energy sources possible. Powering America’s solar training effort was the first in the nation and its wind power training is leading-edge. The Powering America team can help design highly efficient, even “Zero Net”, construction projects or perform energy audits and retrofits for existing buildings. Our expertise helps ensure that the right electrical systems are installed, so that customers can lower their energy costs and quickly recover their investments. 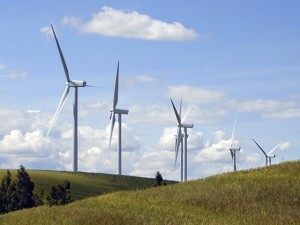 Wind power is on the rise in the United States – tens of thousands of megawatts of cumulative capacity generated by more than 45,000 turbines; the growing numbers are testament to its ability to power communities and the economy. A report from the U.S. Department of Energy concluded that, if wind power could reach 20% of the U.S. electricity supply by 2030, it would not only reduce carbon dioxide emissions by 25%, but would generate roughly half a million jobs in the United States. But for wind power to continue down the path of progress, the nation needs a workforce capable of bringing its potential to full fruition – qualified electricians and reputable contractors lined up, ready to implement whatever wind power plans that may arise. That’s where the Powering America team comes in. This team has invested millions in training programs uniquely positioned to provide the skilled workers the nation demands to push wind power forward. From Massachusetts to Minnesota, Ohio to Oregon, the Powering America team, through its Electrical Training ALLIANCE, is actively training union electricians in the installation and maintenance of the latest wind turbine and solar technology. With 300 training centers across America, Electrical Training ALLIANCE offers apprentices and journeymen a range of rigorous, precision “green job” training that puts them at the forefront of the alternative power movement. In California, IBEW Local 595 put its renewable energy skills on display in a radical redesign of its own training center, combining wind turbines with solar panels to create a building that produces as much energy as it consumes – making it one of only a handful of United States Department of Energy-designated “zero net energy buildings” in the country and one of the first achieved by retrofitting an existing commercial building. 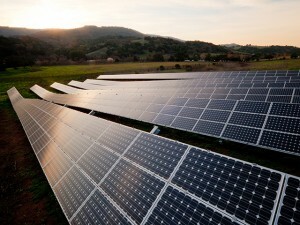 Solar power is more affordable, accessible, and prevalent in the United States than ever before. Since 2008, U.S. installations have grown seventeen-fold from 1.2 gigawatts (GW) to and estimated 20 GW today. But for solar power to continue down the path of progress, the nation needs a workforce capable of bringing its potential to full fruition – qualified electricians and contractors available for your projects. That’s where the Powering America team comes in. 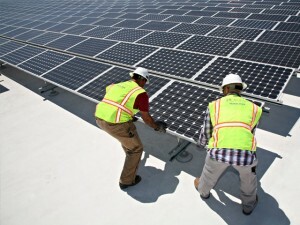 Jointly, this team has invested millions of dollars in training programs uniquely positioned to provide the skilled workers the nation demands to push solar forward. From Massachusetts to Minnesota, Ohio to Oregon, the Powering America team, through its electrical training ALLIANCE, is actively training union electricians in the installation and maintenance of the latest solar technology. With more than 300 training centers across America, the electrical training ALLIANCE offers apprentices and journeymen a range of rigorous, precision “green Job” training that puts them at the forefront of the renewable power movement. 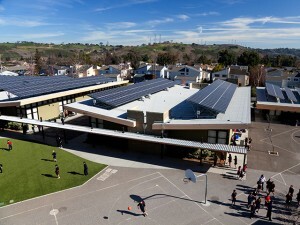 In California, Local 595 put its renewable energy skills on display in a radical redesign of its own training center, combining wind turbines with solar panels to create a building that produces as much energy as it consumes – making it one of a handful of U.S. Department of Energy designated “Zero Net energy buildings” in the country and one of the first achieved by retrofitting an existing commercial building. Growing occupant demand, investor pressures and building code requirements have led to a new standard in high-performance building. As a result, many markets are mandating comprehensive sustainability and energy-efficiency programs. New construction is meeting the challenges through the incorporation of sophisticated building management systems that provide advanced controls to drive energy conservation. However, in meeting today’s requirements, building owners and operators face the sometimes daunting task of bringing an older facility up to today’s expected standards. If recent studies are any indication, there’s a tremendous amount of opportunity to achieve high-performance gains for America’s existing office buildings. Yet, retooling for sustainability and energy-efficiency requires investments not only in the buildings themselves, but in the professionals charged with ensuring they operate at the highest possible levels. In response to the energy savings opportunities made possible through improved control and reliability technologies, the Powering America team, through its electrical training ALLIANCE, has developed a comprehensive training or education program built around a rigorous curriculum that includes hands-on laboratory training combined with online and classroom instruction. As a result the Powering America team offers owners and operators a highly skilled workforce that brings to the project the knowledge required to reduce energy consumption using advanced lighting controls: to adapt/adopt environmentally friendly techniques and decrease the facility carbon footprint; and conserve energy through the use of advanced building management systems. Significantly, the Powering America team brings to new or existing buildings an unmatched set of energy savings strategies, whether lamp, dimming, occupancy, vacancy or daylighting technologies, that ultimately results in impressive occupational gains.